Homeostatic function of microglia in the developing and adult CNS. 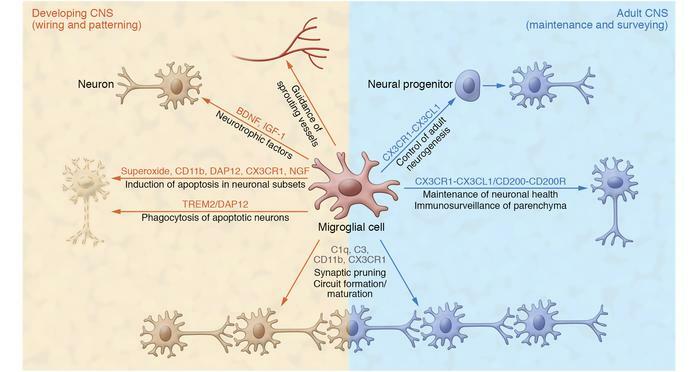 In addition to their function as a resident immune cell in the CNS parenchyma, microglia display a variety of other functions to maintain tissue homeostasis. Microglia modulate wiring and patterning in the developing CNS by regulating apoptosis of neuronal subpopulations, releasing neurotrophic factors, and guiding sprouting vessels in the parenchyma. They also are important for circuit formation and maturation of neuronal networks, and for regulating adult neurogenesis and maintaining neuronal health in the adult CNS.